When does the term “micro-brewery”, or the same word unhyphenated, first appear? Paul Gatza, a long-time director of the Brewers Association, stated it was 1980 in a comment to an article by beer writer Tom Acitelli in 2016. Acitelli was examing early appearances of the terms craft and micro beer and the related expressions. The article appeared online in the Food Republic, you can read it here. …the first usage I am aware of the term “micro” in connection with a small brewer is the Winter 1980 issue of Zymurgy. I can scan you the page if you like. Gatza went on to explain that the group behind Zymurgy, an early, influential magazine of the American Homebrewers Association, started to use the term microbrewery in 1980. One of their team, Stuart Harris, worked in the microcomputer industry and “saw some of the parallels”. So Harris is said in effect to have originated the term. It first appeared in print, if I read Gatza correctly, in a Zymurgy article under Charlie Matzen’s byline in 1980. In fact, the term “micro-brewery” appeared earlier, in late 1969, years before the first personal computer emerged, and not in California or Colorado, but in New York State. The first modern craft brewery would not appear in New York until William Newman’s brewery in Albany, NY in 1981, some years after the first new breweries emerged on the West Coast. Nonetheless, the user of the term was a brewing figure, indeed a famous one in the beer world: the Belgian Jean De Clerck (1902-1978). He was interviewed by a young American journalism graduate, Michael Kuchwara, in an article that first appeared in Ogdensburg Journal on December 30, 1969. While the article does not carry his by-line, later appearances of the same article in the upstate New York press did, so he was evidently the author. Here is an example of subsequent publication. Kuchwara had spent time in Belgium and in a series of at least 10 articles reported to his home audience on the European Economic Community (as then termed), NATO, and other “European” issues becoming of moment internationally. The brewing article appeared as part of this series. The young writer was impressed with Belgium’s brewing heritage, which he called a “brewmaster’s paradise”. He gave interesting details on Belgium’s lively beer scene and contrasted it with the “mild” taste of American beer. 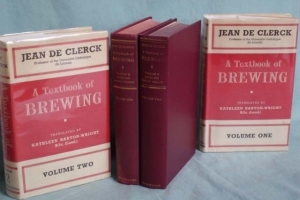 De Clerck, an eminent brewing author and teacher, discussed his background in brewing science and his current tour in the United States to learn more about American brewing developments. The famous brewing school in Louvain is described and some of the focus of the teaching. Many of the students were drawn from developing parts of the world whose governments underwrote the cost. While stating that Belgium still had a sizeable 275 breweries for its population Kuchwara also mentions Stella Artois in Leuven itself as an example of modern, large-scale brewing – and he noted Stella Artois was only a tenth the size of America’s biggest brewery. Having set the tone to understand the modern brewery Kuchwara then describes, as gleaned from De Clerck, the brewery at the Leuven University School of Brewing. The pride of the Louvain School of Brewing is a small yellow room which De Clerck affectionately refers to as “our micro-brewery”. Here the entire brewing process can be seen in miniature from the mashing of the special grains to the final placement of the liquid in bottles. Presumably De Clerck would have used the French “micro-brasserie” or perhaps the term, “mini-brasserie” although the latter is more applicable to a brewpub. De Clerck, who evidently spoke English, must have supplied the term “micro-brewery” to the young and presumably unilingual Kuchwara. But either way, Michael Kuchwara introduced the term micro-brewery to an American audience in 1969 and was the first, it appears, to mention the term in print. Of course, the Zymurgy team may have hit on the term independently, but nonetheless this earlier citation is significant, especially considering its source. Large breweries and brewing schools often have pilot or experimental breweries. It sounds like some familiar with their operation used the term microbrewery well before the beer renaissance in the U.S. and U.K.; at any rate Jean De Clerck did. It’s not of course in the context of a for-profit business but the link to the small scale and experimental orientation of future craft breweries is obvious. The article is revealing in another sense. When referencing the state of American beer in 1969, De Clerck, diplomatic as all brewing consultants are, stated the beer was meant to be drunk ice-cold because of the warmer climate. Kuchwara though had the nose of a good reporter: he muses to his readers, but why is wine the preferred drink (c.1969) of southern Europe? Having tasted good beer in the not-terribly-warm Belgium, Kuchwara had a sense the Stateside brew could be better. De Clerck suggested the way forward, again in his urbane way (Europe was more urbane then). He states in the future one can expect beer to be better both in the U.S. and Europe due to combining the traditions of Europe with the technology at which the U.S. excelled. And that’s exactly what happened to the future of brewing: craft brewing, now a world influence, is built substantially on that premise. Given the vital Belgian influence on craft brewing of which all dedicated beer fans are aware, it is satisfying and apposite that we can add the term “microbrewery” to the legacy. N.B. Michael Kuchwara later became a well-known theatre critic for Associated Press, based in New York. He passed away in 2010 at 63, see this obituary in the New York Times. To our knowledge he did not write on the subject of beer again. N.B. The second and third parts of this post appear here, and here, respectively. Note re image: The image above was sourced from the website of the 2015 Belgian Brewing Conference, here. All intellectual property in the image belongs solely to the lawful owner, as applicable. Image used for educational and historical purposes. All feedback welcomed. Interesting. We (Jess and I) have come across use of the phrase micro-brewery or mini-brewery in this context but, as you make clear, it refers to something quite different — what today I guess would be called a “pilot plant”. It seems to happen quite frequently that a particular word or phrase crops up in the discussion but meaning something different in each cycle. “Golden Ale” might be another example. I suspect that often, because certain elements of language are so common, or so appealing, people arrive at these buzz-phrases quite independently, and wouldn’t surprised if the people who started using micro-brewery c.1980 came up with it without encountering any prior use, in any context. Thanks for this. Certainly the 1969 usage is not on all fours with the 1980 one, but the main difference is the non-commercial context. The other elements, a very small brewery, one typically making a range of experimental vs. standard recipes, the name itself, and the American appearance, are constant. Certainly the emergence of the name in 1980 could have been independent. Still, the older sense of the term might have influenced the later usage in some areas. As an example, many early craft breweries employed consultants who had had long experience in industrial brewing or in brewery schools. I’m sure you have heard the name Joseph Owades for example, he had assisted many start-ups in craft brewing around 1980 including, say, New Amsterdam Brewing in New York. (Matthew Reich). It would be interesting to know if he had used the term, or people at Siebel in Chicago where many craft brewers were trained, or Heriot Watt or UC Davis. If there are earlier uses of micro-brewery it would be useful to know that, just to have it documented. Here is some bio on Owades, from Wikipedia, I hadn’t seen it earlier and I’m putting it here as a placeholder perhaps to write about him later. Good heavens, Gary! This is a beautiful post and I appreciate your research and efforts here. Nicely done. Thanks so much, Sam. We get very little feedback from the beer community, so your’s makes it that much more special. All the best.